Composer, Recording Engineer, Flutist, Video Artist Maggi Payne (b. 1945) is Co-Director of the Center for Contemporary Music at Mills College, Oakland, CA, where she teaches recording engineering, composition, and electronic music. Her primary teachers—flutist Walfrid Kujala and composer Robert Ashley—stand among some of the most influential artists of their respective disciplines. Her sensitivity to timbre stems back to her first exploratory encounters with the flute as a nine-year-old student, and this curious spirit has continued to permeate many of her compositions. Though she is primarily an electroacoustic composer, she has contributed a new work to the flute repertoire every ten years: HUM (1973), Scirocco (1983), Aeolian Confluence (1993), and two solo works, Of All and Reflections (2003). Olivier Messiaen (1908-1992) was a French organist, composer, and theorist whose rhythmic and harmonic innovations made significant contributions to the trajectory of 20th century music. In addition to exploring the concepts of modes of limited transposition, total serialism, non-retrogradable rhythm, and irregular rhythms that do not fit into conventional meters, Messiaen is also noted for his interest in birdsongs. His lasting influence as a pedagogue is overwhelmingly apparent upon review of his list of accomplished students including Pierre Boulez, Karlheinz Stockhausen, Gérard Grisey, George Benjamin, and Peter Maxwell Davies. Canadian born musician Robert Aitken (b. 1939) has enjoyed an active and versatile career as a flutist, composer, and new music champion. The influence of non-Western music traditions on his compositional aesthetic is reflected in his sensitivity to microtonality, color, and timbre. Aitken belongs to a resurgent class of contemporary flutist-composers— a tradition that began in the Baroque era and proved crucial to the recognition of the flute as a virtuosic solo instrument— and their intimate knowledge of the instrument’s capabilities have laid the foundation for a new body of repertoire specifically tailored to the modern system flute. Marcos Balter (b. 1974) is a Brazilian-born composer based in Chicago whose energy and experimental creativity permeate his compositional output. His early exposure to the works of Berio, Reich, and Ligeti and his curiosity about music notation have undoubtedly shaped the textural aesthetic of his works, and living amidst the thriving Chicago new music scene has afforded him access to some of the greatest contemporary performers of our generation. Dai Fujikura (b. 1977) is a Japanese-born composer living in the UK. His list of mentors includes such contemporary classical music giants as Pierre Boulez, George Benjamin, and Péter Eötvös. Though he was born in Osaka, his music lacks a distinctly-Japanese aesthetic— rather, his works represent a convergence of international influences. 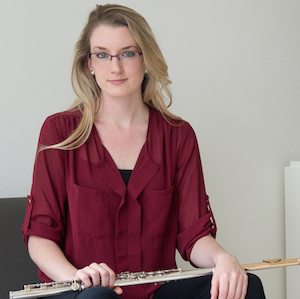 Dr. Amanda Cook maintains a unique, versatile, and active career as a flutist, educator, editor, writer, and music critic.